I want to see this movie with my sister and niece! We would love it! This looks like it'll be a nice movie. I'd like to go with my sister to see it. I want to see it because I think it will be a lot of fun. I love Si-Fi movies and mystery, this sounds like it is a little of both. I'd like to see it because it looks like a nice movie. I want to see this movie because it is the genre I like, adventure and mystery. 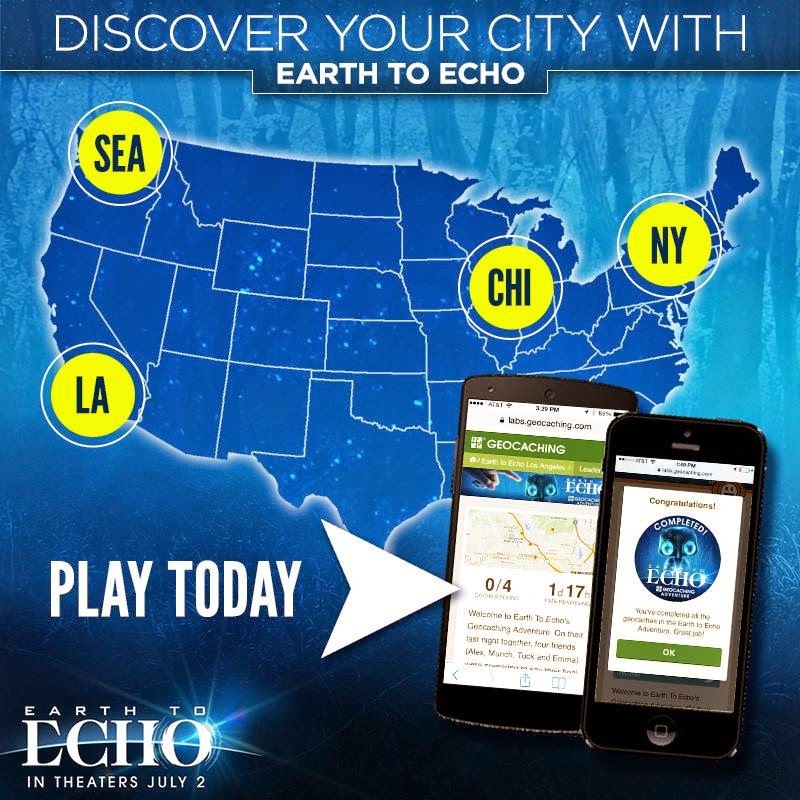 I would like to see Earth to Echo with my daughter because I think she would really enjoy it. I'd like to see this movie because I so enjoy adventure movies. I'd like to see this because it looks like a cute, family friendly movie! I havent been to the movies in over 4 years. I would like to see the movie because you make it sounds so interesting. Thanks for the giveaway! I think it looks cute and like something my youngest daughter would like to see. thank you! I want to see this movie because I can take my grandchildren to it. I would enjoy watching this movie with my grandson. I would like to watch this with my kids because it reminds me alot of ET. I've seen the movie trailer and it looks like a good movie. I'd like to see the movie because it looks like a great movie not only for kids but for adults as well to enjoy as a family. I want to see it because it looks cute and adventurous and is a nice family friendly movie! I want to see this movie because my daughter and I saw the trailer to it in another movie. It looks like a great movie for us to see on our mommy/daughter day. Thanks for the opportunity to enter. I want to see it because it looks like a good movie and my son wants to go see it too. This movie looks like something my kids would enjoy! Thanks for the chance to win! I would like to take my step-son to see it. I would take my nephew to go see this movie. This movie looks good but not too scary. Oh I would love to see this movie with my whole family! Would be a great movie I think that everyone would enjoy together! This is a movie my daughter has wanted to see. We will be seeing it together. I want to see it because it reminds me of a modern day ET. I want to see it because it looks like a good kid friendly movie that we'd all enjoy! This looks like a sweet movie to take my daughter to see. It looks like something we can both sit through. Movie sounds great , would love to go with hubby! This movie looks like something my kids would enjoy watching. I saw the previews of Earth to Echo this weekend and it looks like such a fun movie. I would love to take my kids to see it as they would love it. I did see this at an advanced screening and it was a great movie I would love to see it again. I want to see this movie because it looks family friendly, so I could take my nephew to see it. I would like to see the movie Earth to Echo because it reminds me of a childhood favorite movie. I think my kids will enjoy seeing it with me. It looks interesting and fun for all of us! I always try to take my grandkids to family movies. This looks like a good one. I have seen the previews and it looks like a great movie to take the kids too that is not violent! I'd like to see this movie because it's family friendly and reminds me of ET. Looks like a fabulous movie. I want to take my 8 year old son he has been asking to see this. I want to see this movie because it is a film that I can go and see with my kids. They would like it. I want to see this movie because it looks really cute! id like to see with my daughter ! I'd love to see this movie because it looks like a smart Sci-Fi movie my whole family would enjoy seeing together and those are hard to come by! I want to see this movie because it looks like a good clean Sci-Fi film! My son really wants to see this movie, and I love summer family movies. It seems like a nice family movie everyone will enjoy! I want to see this movie because it looks like a great family film! I want to see this movie with our granddaughter. It sounds interesting. I want to see it because it looks like a great family movie. I want to see this movie as I love finding movies that I know the whole family can go to see together.